Diwali is a time to celebrate with family and friends. This festive season watch the fun-filled horror comedy Golmaal Again – a sure shot opportunity for quality time with the folks. So this Diwali No Logic Just Magic. 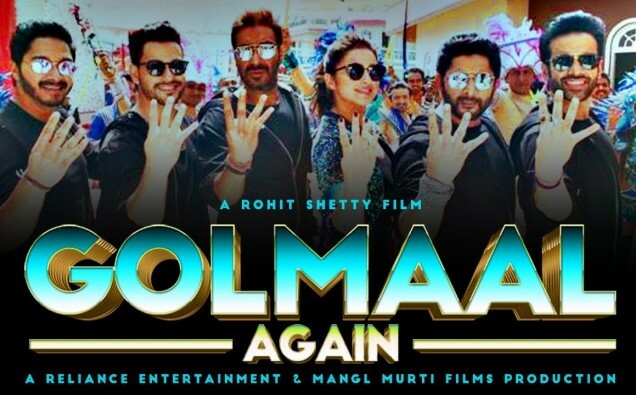 The trailer of ‘Golmaal Again’ shows that this film will be bigger than any of the previous films in the series. The production budget and the hard work put into making this film is a lot and the audience responded positively to the trailer, with it receiving more than 20 million views within 24 hours of its release. Golmaal Again is the fourth film in the super hit franchise of Golmaal series and the tenth film to bring together the tried-and-tested Ajay Devgn– Rohit Shetty combination. Devgn and Shetty first came together in the thriller Zameen. The first Golmaal film was released in 2006. Rohit Shetty has got his writers to pack in the action from frame to frame. It is inescapable fun with Golmaal Again. Ajay Devgn was last seen in a comedic role ‘Bol Bachchan’ in 2012 after which he focused on the action and drama genre. ‘Golmaal Again’ marks the return of Ajay Devgn to the comedy genre where he has witnessed immense success, both critically and at the box office. A refreshing addition to the film. Parineeti is full of life. It will be great to watch her join this mad gang! While it will be interesting to watch Tabu, who is associated with serious cinema, to do an out and out comedy like this. As seen in the trailer of Golmaal Again, Tusshar Kapoor finally has a voice in this film as opposed to the earlier Golmaals where he plays a mute. Even though this is the role that every Golmaal fan remembers, it will be great to see what he has to say….finally! A relatively new genre, Golmaal Again is all horror and comedy and will make audiences shiver and giggle. Get ready to be spooked this Diwali with the laugh-riot Golmaal Again, releasing in cinemas through Reliance Entertainment on 20th October! FIRE IN BIRMINGHAM CITY CENTRE!